エレクトロニック・ミュージックのパイオニアDJ／プロデューサーにして、音楽宇宙を自由自在に行き来するジェフ・ミルズが、長年の構想を形にしたSPIRAL DELUXE (スパイラル・デラックス)。デトロイト、パリ、東京を拠点にするSPIRAL DELUXEの4人が一堂に会する貴重な機会に新作「Voodoo Magic」発表記念でショウケースを行うことになりました。メディア、関係者中心のイベントに特別100名様のみチケットを販売します。1時間のパフォーマンスでは「Voodoo Magic」からの曲とともにジャムセッションスタイルでフリーなプレイを展開する予定です。パフォーマンス後にはメンバーも会場でリラックスする予定!? [UPDATE! 11/4] A limited number of additional tickets have also Sold Out. Thank You! Spiral Deluxe is a collaboration and Electronic Jazz quartet that explores the various spectrums in our music Universe. It’s the meeting of minds of four musicians from different styles and background that dedicate themselves for searching harmonic divine. A musical excursion that discovers the higher level of music consciousness. 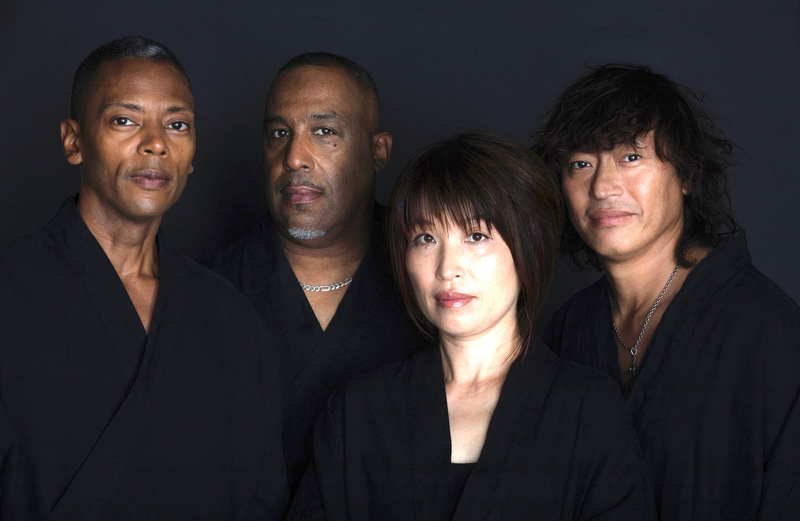 Formed in 2014, the band came together as a project and vision of Jeff Mills, who had the idea to create a “super group,” a band of highly skillful players. Mills began the search to find this unique mixture of musicians, that not only could adapt to new ways of playing, but each could contribute their vast amount of insight and knowledge to this special chemistry. Spiral Deluxe “Voodoo Magic” is the result of a 2-day recording session at the famous Studio Ferber in Paris. Most tracks on this release were recorded in one-take recordings to “capture the moment”, which is a vital element to what makes Spiral Deluxe so unique. “Let It Go” was composed by Spiral Deluxe and features even more masterful artistry of the likes of veteran Vocalist Tanya Michelle, with the mix production of the one and only Detroit native producer and DJ Terrence Parker! Born in Tokyo, Kenji moved to New York City when he was six years old with his family. Influenced by his father who is the most famous trumpeter in Japan and known among jazz scene all over the world, he started trumpet when he was 9 and enrolled at La Guardia High School of Music & Art & Performing Arts at 15 to follow suit with the graduates like Marcus Miller, Omar Hakim and Bobby Bloom.He changed his instrument to Bass guitar at the age of 17, when he started to learn from Jaco Pastorius. In 1986 he started his professional career, joining a house band at Apollo Theatre as well as playing with Joe, Jessica Simpson and Blondie.Since then, he constantly works world-widely with great talents such as Joe, Christopher Max & The New Millennium etc. Also he forms his own band, recording own albums. In 2014, he finished the 3rd album, “Jino Jam” .Kenji is also active as a song writer, providing songs for Japanese artists such as Zeebra, AI, Kana Nishino. Meisa Kuroki and have hits selling over 200K sales/ a million downloads. Gerald Mitchell born and raised in Detroit is a Musician, Producer,Band Leader,Dj and Sonic visionary whose music has made a huge impact on Detroit house and techno. From his work on Underground Resistance’s Interstellar Fugitives “Soul Saver” (aka UR 044) project to his Celestial Highways classic on Metroplex and early house production on Soul City, Gerald’s music has always been recognized by it soulful strength. His work with Underground Resistance and Dj Rolando led to the anthem ‘Knights of the Jaguar; and now the group Los Hermanos. He has brought his experience as a live musician into a group that expresses jazz fusion, gospel and funk into stunning electronic music in which he became the musical director for UR’s Galaxy 2 Galaxy / Los Hermanos Live tour 2005. Gerald has collaborated with many well known artist,dj,producers,and programmers from around the worldhe has remixed and released with various well known electronic labels a legendary leader in the electronic music scene worldwide. Gerald has begun his solo career after touring as Los Hermanos Live Bandand as a dj in many festivals and clubs in Japan, Europe. USA. A founding member of Buffalo Daughter, the electronic, experimental rock band formed in 1993 in Tokyo. The band has signed to Grand Royal label run by Beastie Boys in 1996, since when their activities are wide spread to all over the world. After signing the worldwide deals to Emperror Norton in Los Angeles, V2 records, the band has established their own label Buffalo Ranch. “Konjac-tion” released in 2014 is their seventh album and the band is actively performing mainly in Tokyo. In 2010 Ohno created “The Rainy Table” for the theater performance for Strange Kinoko Dance Coampny for YCAM, which became her first solo works playing piano, synthesizers, steel pan and bass guitar. She does various collaborations with wide range of artist such as Cornelius aka Keigo Oyamada, Yann Tomita, Morgan Fisher and Hajime Tachibana. A new project started in 2014, Hello, Wendy! is a female synthesizer quartet performed and produced by Ohno. Recently from 2016 Ohno participates the world tour of Cornelius as a bassist. Deeply inhabited by science-fiction, DJ and producer Jeff Mills adopts its ideas, concepts, stories and esthetics from the outset. For him, Space is an obsession and his music almost becomes a musical science-fiction. Conquering space, his music embodies the future while both respecting the past and remaining well into the present. When he founded his own record label Axis in 1992 -represented by its logo consisting of four triangles pointing to an invisible center- Axis takes the rotating principle of the solar system as aesthetics, concept and model of creativity. From the beginning, his first releases explore futuristic and science fiction topics such as “Mutant theory,” “Tomorrow,” “Art / UFO”, “Time Machine” and “Alpha Centauri.” For Jeff Mills, the future is a powerful creative drive which explains the artist’s ceaseless activity.